Neutrogena UltraSheer® Liquid Daily Sunblock has given me new reasons to love to wake up and apply a facial sunscreen. 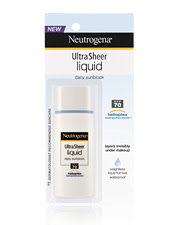 I used to think of my daily routine as somewhat tedious but as I started to see the results of the Neutrogena UltraSheer® Liquid Daily Sunblock on my face, I began to look forward to putting on my “shield” every morning. It smells great, easy to apply, it feels weightless, and the best part of wearing Neutrogena UltraSheer® Liquid Daily Sunblock is that I can wear it under my makeup and it gives my face a sheer glow without making my face look greasy. More importantly, Neutrogena UltraSheer® Liquid Daily Sunblock gives me peace of mind as I know I am protected from the harms the sun can cause my delicate skin. Would you like to review UltraSheer®, too? Then go to http://www.giantwavepool.com/ultrasheer! Or get $2 off your UltraSheer® purchase at http://www.neutrogena.com/suncoupon.